Google Translator Toolkit enables you to manage, organize, and edit your translated documents, which is helpful if you do a lot of translating, either as a hobby or professionally. If you’re familiar with other Google applications, such as Drive or Gmail, then the experience of managing translations with Google Translator Toolkit will be quite familiar. Google Translator Toolkit is a web-based application, just like Google Drive or Gmail, which lives on the Web. You have to use through your Web browser. The main advantage is that you can access the toolkit from any computer, whether you’re at work, at home, or at the library. Checkbox drop-down menu: You can filter down the list to All, None, Completed, or Incomplete. Download: Click the Download button to download the translated version of the document. Hide: If, for some reason, you want to hide a document, click the Hide button. The document is moved into the Hidden folder at the left, where you can still view it and choose to unhide it. Delete: Click the Delete button to get rid of a translation. Be warned: You won’t be asked to confirm deletion. When you click Delete, the document is moved into the Trash folder at the left. You can still get it back by going to the Trash folder and restoring it. Request Professional Translation, which fetches quotes from translation vendors and tells you how much it’ll cost. Use this only if, for some reason, Google’s translation isn’t adequate, such as for official or business-related documents. 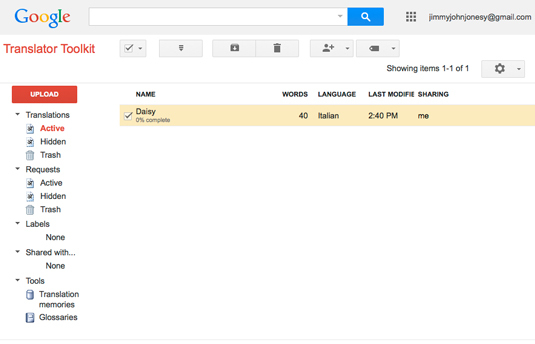 Share with Others, which enables you to share the document via e-mail with others with a Google account. You can decide what others can do with the document, such as View Only, Comment Only, or full Edit permission. The documents you share appear under the Shared with… folder at the left. Label: You can categorize your translations with labels for easier sorting. The labels appear in the Labels folder at the left, and you can click each label to view those documents. Figure 1: Google Translator Toolkit.